Change filters can be easily replaced by a complete new filter. The filter element is firmly connected to the filter housing. Change filters are used for filtration of oil, fuel and air. Oil filters are used in the engine and gearbox. In the oil filter, impurities, such as dust, soot and metal particles caused by abrasion, are removed from the oil. In the centrifugal oil filter, the finest particles are extracted, which are not separated in the fullflow filter. 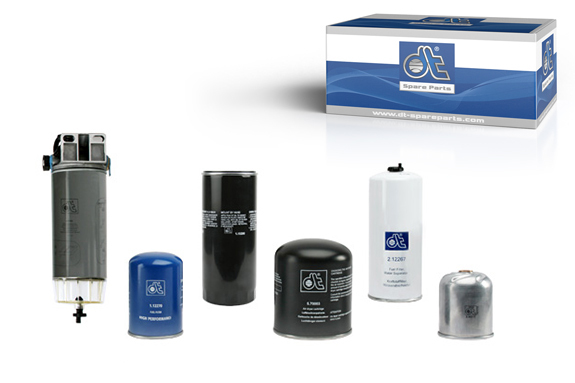 Fuel filters free diesel fuel from solid particles, such as laquer chips, dirt and rust. Water separators separate water from the fuel. Air dryer cartridges filter from the air oil particles, which can otherwise penetrate the compression chamber during the lubrication of the compressor with motor oil. Modern cartridges with coalescence filters prevent fine oil particles (aerosols) from penetrating the braking system. The high-quality filter paper materials used in DT® Spare Parts change filters are exclusively manufactured in Europe and are adapted to the filtration requirements in terms of pore density and volume. Fatigue test (the filter is subjected to 25,000 pressure surges in the range of 2 to 9 bar. The extensive range of DT filters includes all insert filters, such as air filters and cab air filters.